St. Austell is the first town of any size in Cornwall. 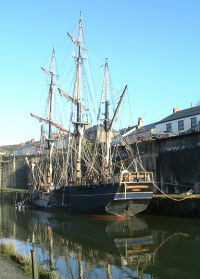 It is now a popular resort that has been boosted by the recent arrival of the Eden Project, while St. Austell itself is set back from the sea; the area that connects to the sea is the port of Charlestown which is popular with visitors. However St. Austell's growth in the past has been as a result of china clay extraction rather than tourism. The local chemist William Cookworthy discovered large deposits of this mineral in the middle of the 18th century and this led to the growth of the town for many years. China clay extraction is still very important to the local economy but to the same extent as previously. Today tourism is of great importance and the local environment and spectacular scenery is what attracts visitors to the area. The town itself is a mix of old and new with narrow twisting streets in some areas and modern shopping precincts in others. However it is the abundance of beaches and coastal views that bring people flocking to the area. 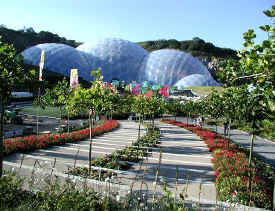 The Eden Project is an exciting new tourist attraction which opened recently and has added to the towns popularity. The project converted a large disused quarry site into a centre for the study and culture of plants from around the World. The site has three large biomes which act as huge greenhouses in which tropical plants are housed, there is also a restaurant and shop area. Charlestown is a small settlement close to St Austell and situated on the coast - it used to act as the port for the main town. They still carry out repair work here, to tall ships and other sailing vessels. Carlyon Bay is the largest beach area with a large, flat, sandy beach. At present (2006) there is a plan to build a £200m resort on the beachside area of Carlyon Bay. It is claimed by the developers, Ampersand, that this development will bring big economic benefits to the area but not all local people are convinced. Nearby is Gorran Haven Beach and Porthluney Cove Beach if you prefer a more secluded spot. St. Austell Brewery Visitor Centre - Tour around Cornwall's famous 140 year old, family run brewery.